BUS STATIONS; AN ENDANGERED SPECIES. It’s obvious, isn’t it? In any major town where you when you need to catch a train you head for the train…er, sorry, railway station. Similarly for taxis you head to the taxi rank, so for buses you head to…… Surely there’s a bus station here? Surely in a town of this size there has to be a bus station? 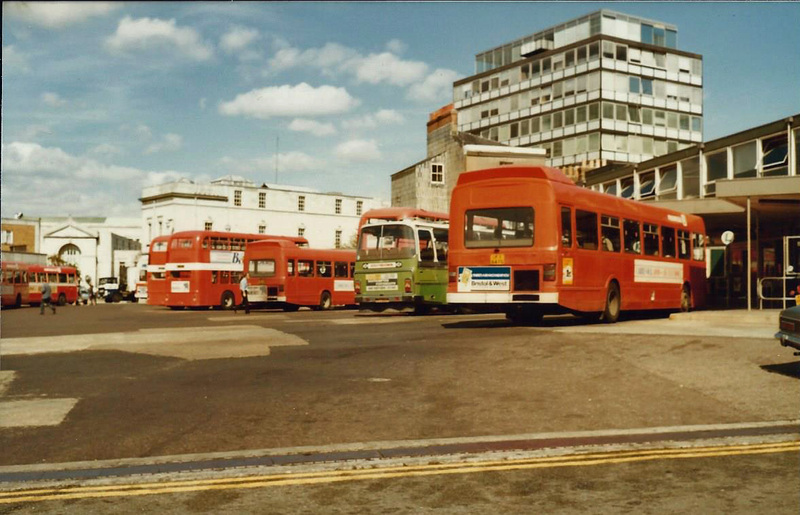 The boarding bays at Southampton Bus Station in 1983, four years before closure. Maybe then it’s not quite so obvious. Amazingly enough, towns and cities such as Brighton, Bournemouth, Tunbridge Wells, Southampton, none of them can boast having a bus station as such. They are not alone and I’ll return to this shortly. 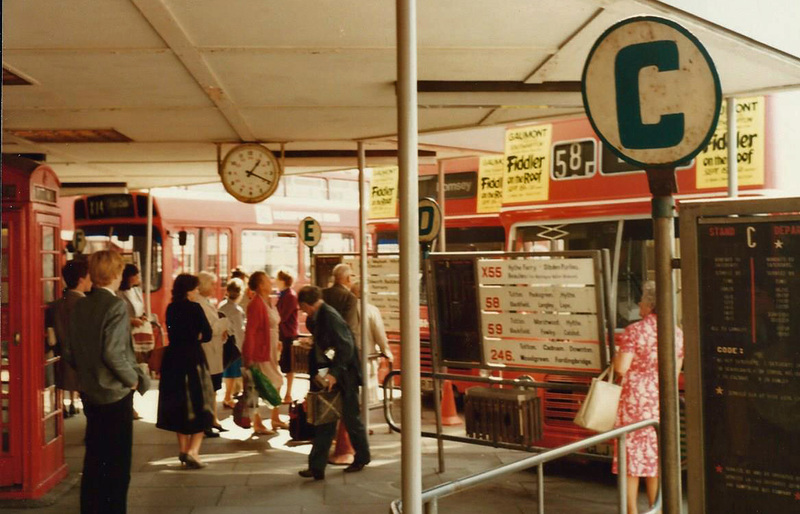 Not so long ago the bus station was one of the dominant and most useful facilities of any town centre. Locations could vary, many being on the edge of the town centre, others would quite logically adjoin the railway station to provide an interchange facility, while some would have the luxury of sitting right in the heart of the town, such as in Stevenage where it formed part of the new town centre shopping square, or Guildford where the bus station is ‘stapled’ on to the Friary Shopping Centre. 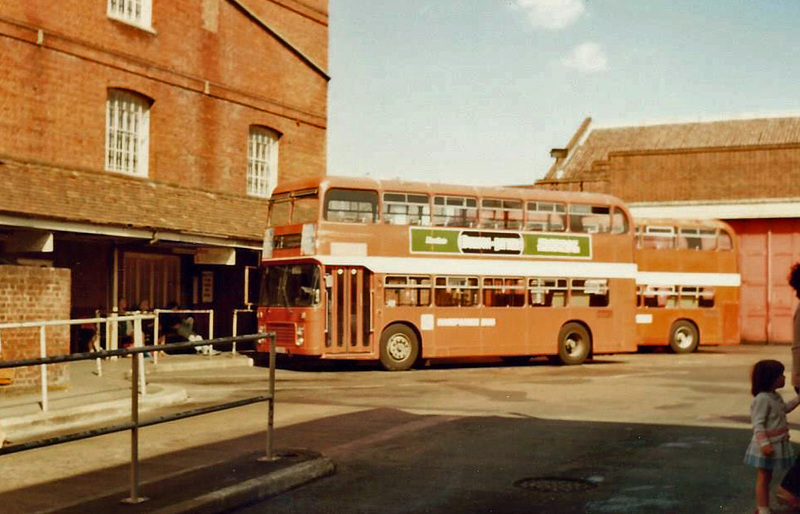 Alder Valley Leyland Nationals parked in the bays of Guildford’s Friary Bus Station in 1982. The bus nearest the camera is in an Aldershot and District commemorative livery. 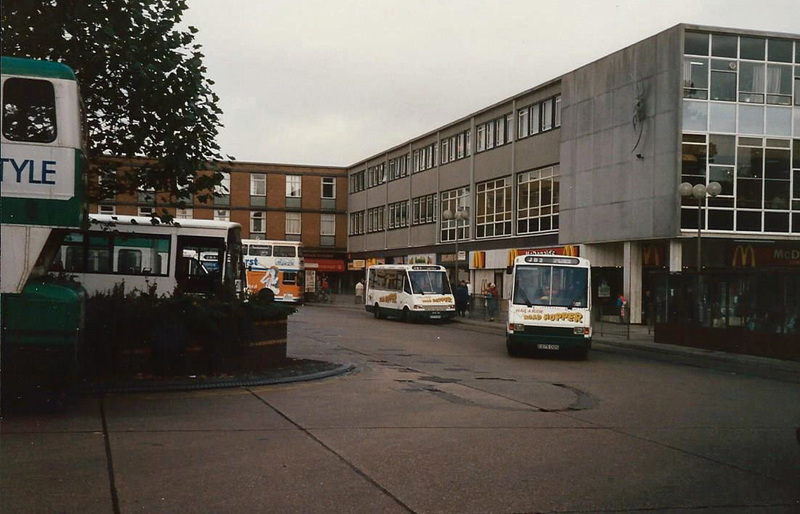 Stevenage Bus Station in the town square, 1988. While the facilities on offer could vary there would usually be an enquiry office, sometimes one for each bus operator if there was more than one. These would usually handle booking facilities for long distance coach services or local excursion companies. Quite often there would be a cafe which would be an extension of the bus driver’s canteen serving proper dinners! Those of us in Sussex may well remember the refreshment rooms provided by Southdown at Haywards Heath or Lewes, while Midland Red’s catering was well above standard, they even went as far as embossing their logo on the cups and saucers and even on the sugar cube wrappers. The quality of such facilities, along with the public conveniences was vital being that the bus station could also be the departure point and refreshment stop for many of the long distance express coaches. 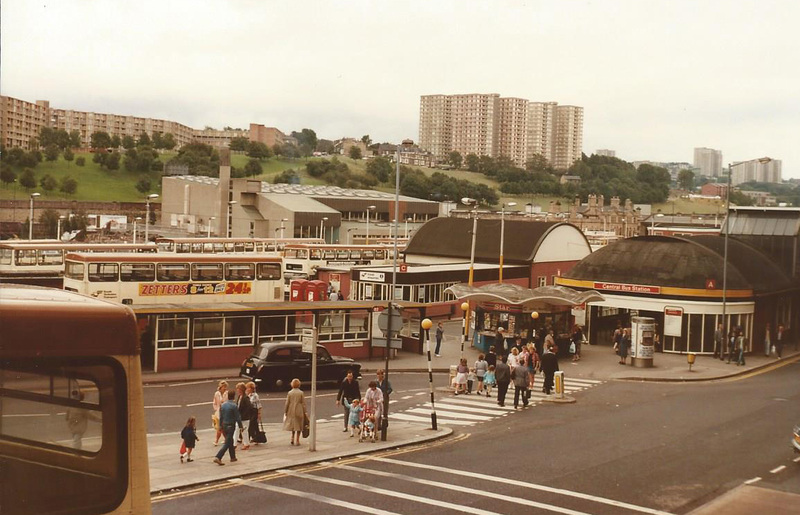 Indeed, a good bus station cafe was often THE place to go in town for a decent cup of tea. Proper dinners and tea in REAL mugs at the Winchester Bus Station cafe, 2015. On top of this, the bus station provided space for vehicles to lay-over between duties while their drivers took their refreshment breaks. But of course, providing these facilities is not cheap and those bus parking spaces occupy a vast area of land which could be earning money……. 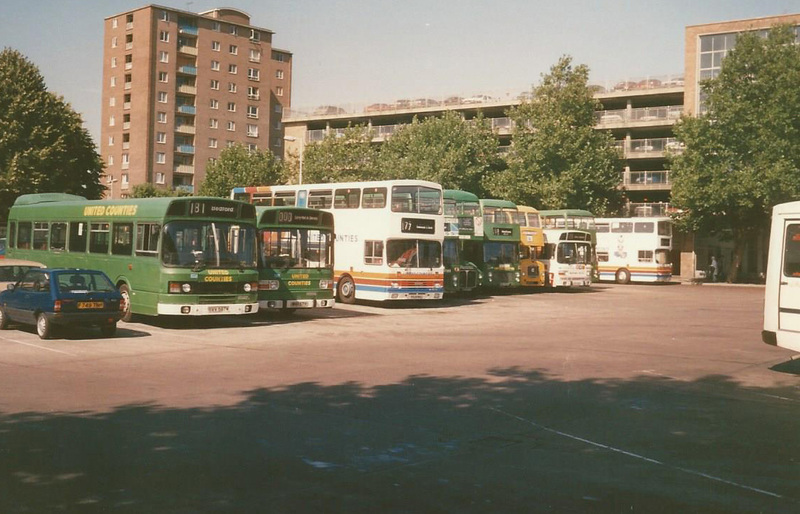 United Counties buses in the layover space at Bedford, 1989. The corporate image of Stagecoach is slowly creeping in…. 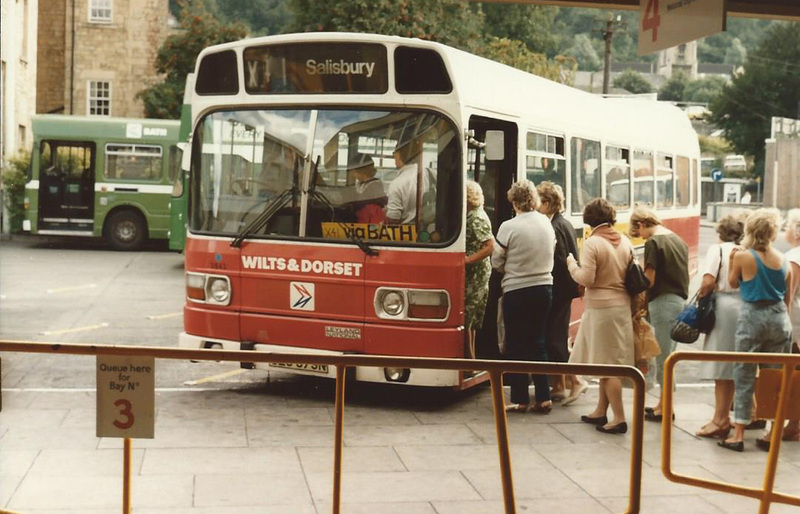 It was this that sealed the fate of many bus stations in the era of privatisation. Bus operators that had previously been state owned now had to face competition from smaller newcomers on the scene. Each bus route had to pay for itself, there was no cross subsidy from serving a decent cup of tea and a hot sausage roll. Slowly but surely several bus stations across the country were sold off to the developers and the buses were relegated to on-street terminal and departure points. Having been faced with a long walk through a busy town centre while trying to find the correct bus stop, the intending passenger then has to wait on a pavement already crowded with pedestrians and shoppers. Enquiry facilities, where they exist, are often relocated to a shop unit somewhere in the town centre, but not always somewhere obvious. A way to entice people back onto public transport? I think not. 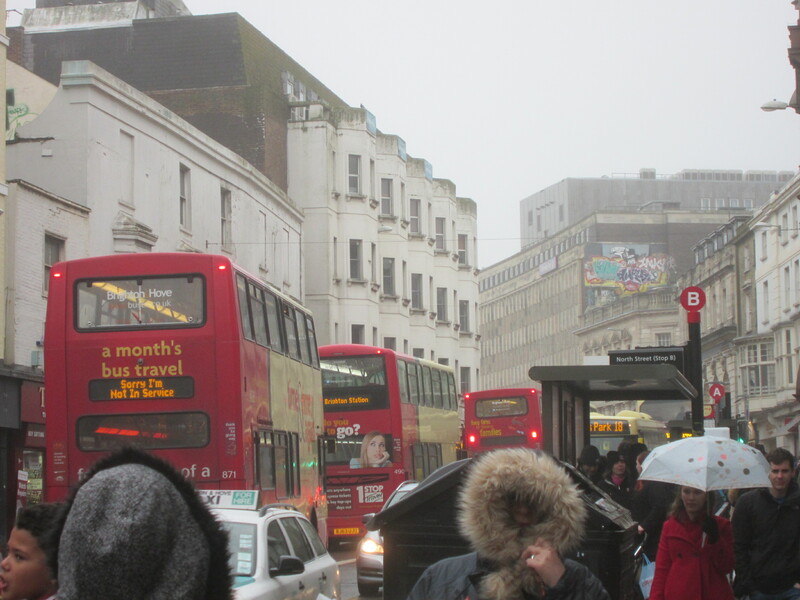 The lack of a bus station forces buses to clog up busy streets and passengers to wait on crowded pavements obstructing the flow of pedestrians as seen here in Brighton. 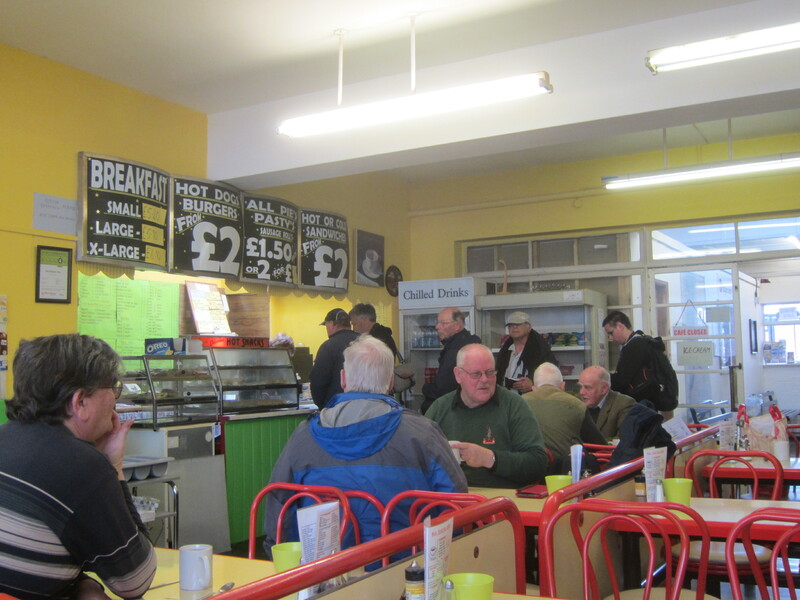 Many bus stations still survive, albeit in some cases with reduced facilities, although the one at Winchester still has it’s traditional canteen style cafe intact, definitely worth a visit! But while some towns like Bedford have been lucky enough to see their bus stations up-graded or rebuilt, in all too many they are an endangered species, their futures (or lack of) usually decided by those who would never use a bus. 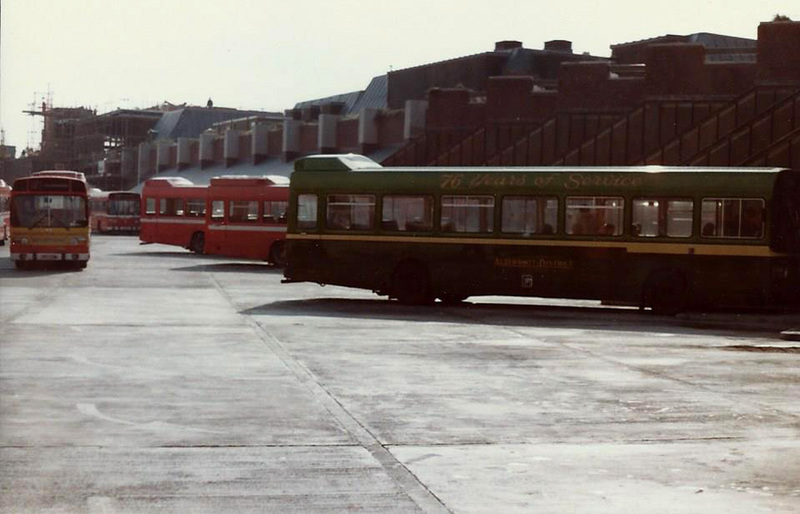 The extensive bus station at Sheffield in 1985. Bath, 1984. 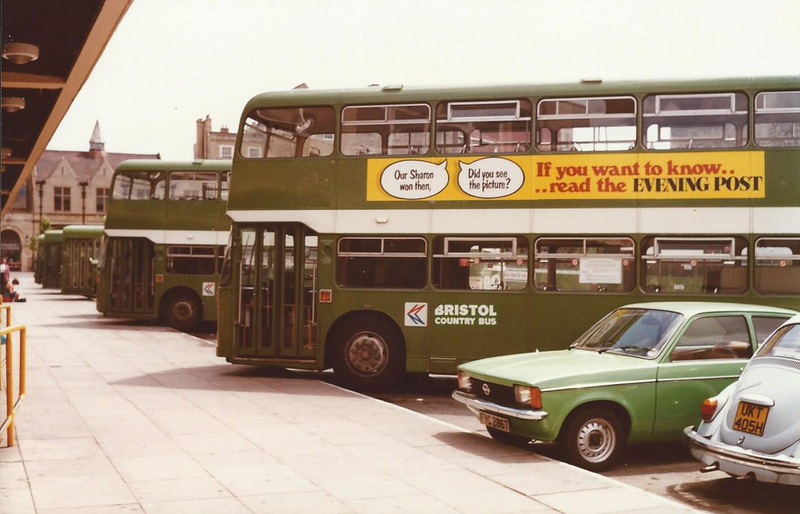 Bristol Country Bus would shortly become Badgerline and form the foundations of First Group. 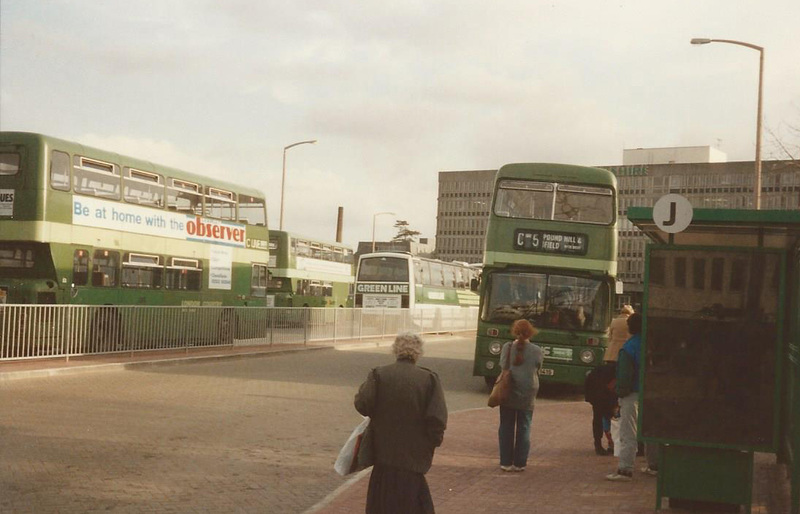 The second Crawley Bus Station shortly after opening in 1990.